I have left it late in life to watch cricket in Scarborough ; also, at least, forty years too late. At the ground on Sunday I bought a copy of “Sweet Summers“, a compilation of the writings of J.M. Kilburn, for many years the Cricket Correspondent of the Yorkshire Post (owing to some terrible mix-up it had been signed by Geoffrey Boycott, but I kept it anyway). Kilburn was the Laureate of Yorkshire cricket, and, in particular, the Laureate of Scarborough and its Festival, which sometimes tempted him into a slight relaxation of his scrupulously decorous prose style. This was not the case over the week-end (the entertainer in our hotel, a Doncaster songbird, seemed more concerned with the deficiencies in her love-life) and I doubt whether it is any longer even true during what is left of the Festival proper, now shrunk to five days in August. 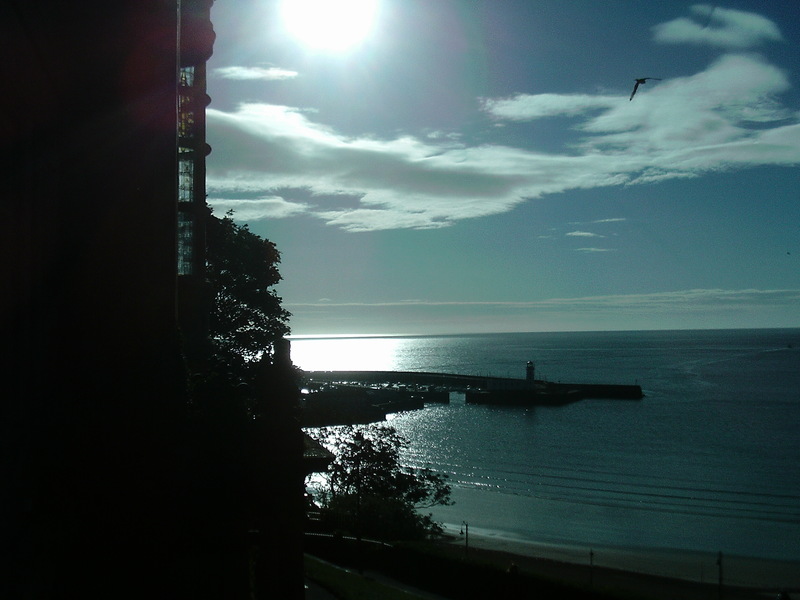 We stayed in the Grand Hotel (historically, an essential part of the Festival experience). So intense was the interest in the players who were staying there that a special room (“the Cricketers’ Room”) was set aside for them to escape pestering. It closed in 1979, by which time public interest in cricketers had, presumably, subsided sufficiently to allow them to eat their breakfast unmolested. 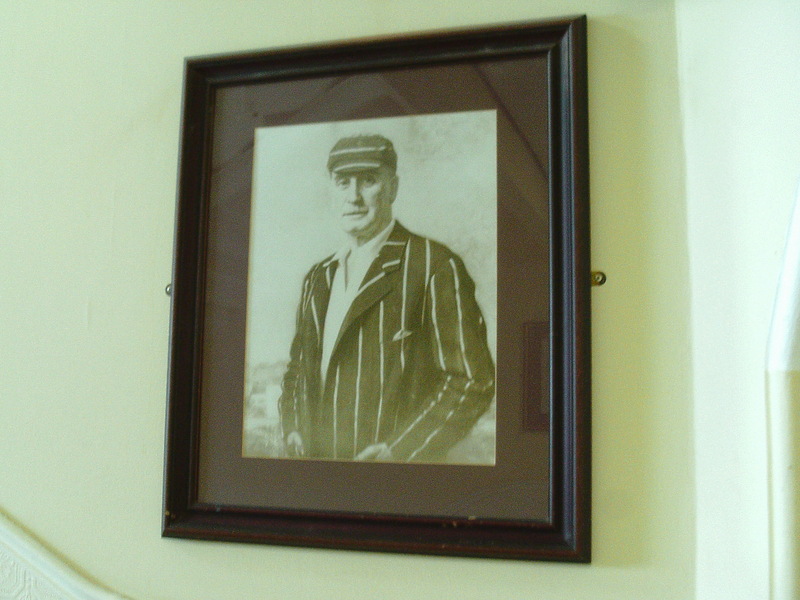 In 2016 I doubt whether even Joe Root would be greeted by more than a flicker of recognition over his cornflakes, and I wonder how many visitors would be able to name this character, who gazes, all lordly, down at them as they make their way to their rooms. lf I am forty years late for the heyday of the cricket festival, I am about a hundred and forty late for that of the Grand, which, after various changes of ownership, now combines the architecture and décor of a Belle Epoque spa hotel with the ambience and amenities of an English holiday camp (a sort of L’Année dernière à Pontins effect, “grand” in both the French and the George Formby senses). I was initially puzzled by that phrase “denial of frivolity” (the Grand struck me as a vast monument to frivolity), but I suppose what he means is an undertaking that is essentially frivolous, yet taken entirely seriously. Which brings us neatly on to Yorkshire cricket (and Kilburn’s writing about it). Lancashire cricket has accommodated exquisites such as Reggie Spooner, who would be dismissed as poseurs in Yorkshire, irresponsible egotists like Archie MacLaren, who would be taken down a peg or two, buffoons of genius like Flintoff, amateurs, dilettantes, piss-artists and assorted comedians who would all be regarded with grave suspicion the other side of the Pennines. It has also (perhaps because its two main cities are ports and its main industry relied on an import) been more outward-looking and accommodating to outsiders : Lloyd and Engineer looked no more out of place than Ted McDonald had fifty years before. Yorkshire is not simply inward-looking, but it does have a sense of unselfconscious mental self-sufficiency that is, I think, found nowhere else in England. (Kilburn, unlike Cardus, never left his native county, and never saw any reason to.) If Scarborians are insular, that is forgivable in a setting where the sense of living on an island is so intense, where Europe seems so far away and the open sea so inescapable. The atmosphere at North Marine Road is not, perhaps, entirely representative of the Yorkshire attitude (Scarborough is, as Kilburn says “Yorkshire cricket on holiday”) but there was no mistaking that it was a Yorkshire crowd ; not unthinkingly partisan, but, as he suggests elsewhere, more deeply and personally identified with the fortunes of their team than the supporters of other English counties. The ground itself was larger than I had expected, with a capacity roughly equal to that of Grace Road (apparently the crowd on Sunday was 3,500, Yorkshire’s largest of the season) and more modern. There was one wooden stand (where I spent most of the day), and an expanse of wooden banking (where the rowdier element congregated), but there were also new stands with plastic tip-up seats and, rather to my disappointment, no deckchairs (and no brass band). 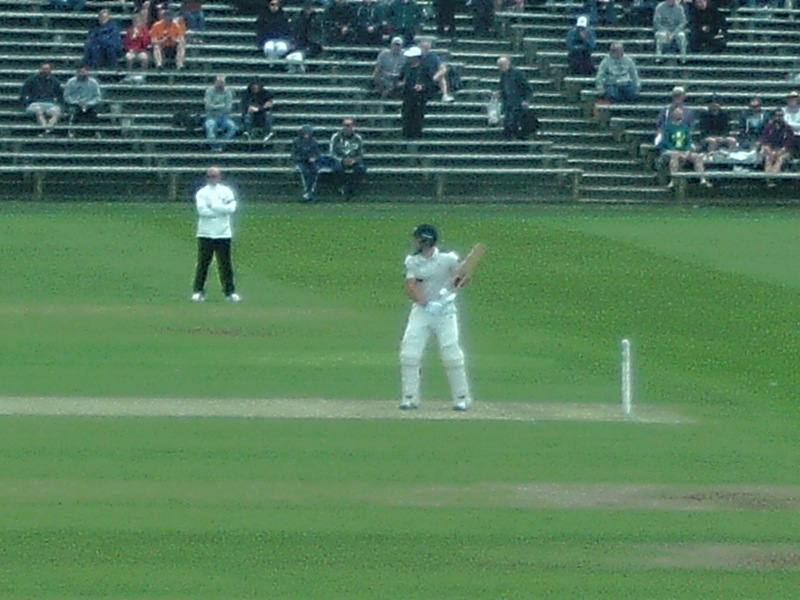 The first ball of the day saw Adam Lyth play the archetypical Yorkshire opener’s shot – the leave. Unfortunately, the ball, from Tim Murtagh, moved in at him, kissed the face of his bat and dropped neatly into the wicket-keeper’s gloves. This brought Kane Williamson (appreciated in the same way as a good club professional, though I don’t suppose he is expected to help roll the wicket) in to join the other opener, Alex Lees. to the arc of his strokes. He bats as if inside an invisible sentry box and, if (perish the thought! ), he had walk-on music, it should be “The British grenadiers” (“Some talk of Alexander and some of Hercules“). He hits his boundaries with a crack like a pistol shot, whereas Williamson strokes them silently, as if batting with a giant feather. Lees and Williamson’s partnership proved the most enjoyable part of the day (though not, I think, the crowd’s favourite). Williamson was out in exactly the same way as Lyth, which brought Gary Ballance to the crease. Lees had not looked in great form, but compared to Ballance, he seemed to be batting as if in a dream. Ballance is always an awkward, limited player but, at the beginning of this innings, he seemed like a child playing with a bat two sizes too big for him. Observing his slow progress to a century (shortly before the close) was like watching a three-legged donkey giving rides on the beach : inelegant, at times painful to watch, but astonishing to see it done at all. After Lees had gone (for 63), and Gale soon after, Ballance was joined by Tim Bresnan. Although Ballance is an old Harrovian from Zimbabwe, he embodies enough of the stubbornness of the stereotypical Yorkshireman, and makes enough runs, to have won the goodwill of the crowd : Bresnan is echt-Yorkshire and claims it as his birthright. As the day wore on (and, between Ballance’s scratching and poking and Roland-Jones’s lackadaisical traipse back to his far-distant mark, it might have seemed a long afternoon in less pleasant surroundings) Pevsner, had he dropped by, would have detected many of the same “gesture[s] of assertion and confidence” in the crowd as he had in the architecture of the Grand Hotel. As it was, Ballance’s painstakingly constructed platform was, eventually, to be washed away, like an afternoon’s sandcastle erased by an evening tide. I should also say that, as on every occasion I have seen them bowl together, Tim Murtagh was more effective than either Finn or Toby Roland-Jones. I have never heard Murtagh mentioned as a potential England player (and now he never will be), whereas, as I have learned while writing this, both Finn and Roland-Jones (not to mention Ballance) have been included in the squad for the next Test match. Murtagh, I suppose, “doesn’t look like a Test bowler“. I walked back to the Grand, not, as I had arrived, along North Marine Road, but along the seafront. A woman, having drained the weekend to the dregs, had collapsed outside a pub and was receiving medical attention on the pavement, some Italian goths were photographing Anne Bronte’s grave, another drunk was groping blindly in the gutter for something to throw at his companion and, at the hotel, a man in an MCC panama, with the glint of happier days in his eyes, was checking. And on all of this, it being only July, the evening sun shone brightly and high in the sky ; there were no long shadows on the outfield, no sun setting over the bays, no chill in the air, none of what Cardus called “the ache of festival cricket“. If I want that, I suppose, I shall have to come back later in the year, or another year, which I should like, if it is not too late. The scene-setting is fascinating; the description of the cricket superb. Lovely piece. Thanks very much, Chris. If you look closely, I’m also wearing a raincoat – I was disguising myself as Uncle Mort in an effort to blend in with my surroundings. Actually, we’d just arrived and were about to go out again, so I didn’t bother to take them off. Miss.B. snapped me sitting on the windowsill, gazing soulfully into the infinite (or possibly at a chip shop). Lovely piece – thank you very much …. I true prefer Cardus by a whisker …. Thanks, Roy. Good to hear from you & glad you enjoyed it. A great piece of writing, which makes me feel so fortunate that I first watched cricket at Scarborough in 1961, and caused me to fall in love with the game. The day I spent there last year (day 1 v Durham) was probably the best day of cricket I have ever watched…..OK, slightly shaded by the victory over Australia in 1975. To reduce the ground to one four day game would be a travesty. Just one pedantic point, Grace Road can only seat 4,000 people, Wisden records the attendance at the Durham match last year (over in three days) as 13,700, rather more than the season’s first class attendance at Leicester. Thanks very much, Richard. Delighted to have a favourable comment from someone who remembers Scarborough in its heyday. My point about the capacity was really only that I had pictured it as an “outground”, perhaps like Queen’s Park, Chesterfield, whereas it is of comparable size to one of the smaller County HQs. I’m sure Yorkshire do attract bigger crowds than Leicestershire, although, of course, our population is only about one fifth of theirs (and they don’t have to contend with having their best players lured away by larger counties).